The AMR 35 (Auto Mitrailleuse de Reconnaissance) was not initially ordered by the army. Before the AMR 33 had even reached production stage, Louis Renault took two prototypes and completely overhauled them, starting in February 1934. Trials showed indeed the weight distribution -due to a forward-mounted engine- was a serious issue, and he addressed it first by placing a new, more powerful Nerva Stella 28 CV, Renault sport coupé regular engine. Changes were made accordingly to the transmission, because the drive sprockets were maintained at the front. This also considerably lowered the noise inside the fighting compartment. The ventilator and exhaust pipe were also shifted to the rear. The weak suspension of the AMR 33 was completely changed and tested on a third prototype made of bolted boiler plates in September 1934. During the first trials at Vincennes, speeds up to 72 km/h (44 mph) were reached, an impressive feat for any tank of that time, especially with such a small engine. Louis Renault did not intend to support the cost of upgrading the production line, however the army was impressed, and General Flavigny insisted these changes had to be made. Cavalry officers noted that the engine was perhaps too delicate for military service and later asked for a sturdier one. Therefore, the second prototype was fitted with a 432 22 CV four-cylinder bus engine. Top speed was still 63 km/h (39 mph), with a weight of 5.03 tons. It was subsequently accepted into service as the AMR 35 and followed the AMR 33 on the factory line, sanctioned by an official order on July, 3, 1934. 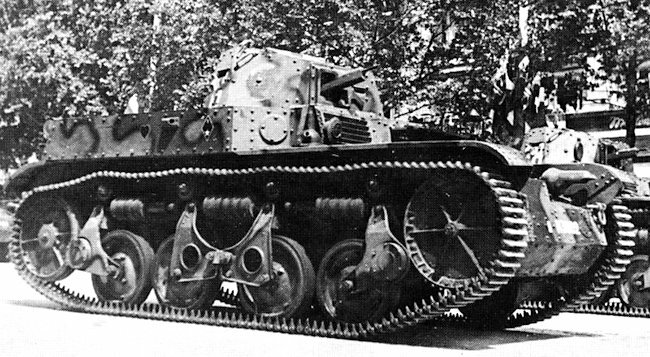 Renault AMR-35 tank with the AVIS-1 turret armed with a 7.5 mm machine gun. The initial plans introduced a specific command vehicle fitted with a AVIS-1 turret (“Atelier de Vincennes”) armed with a 7.5 mm (0.295 in) machine-gun and equipped with a top observation hatch. 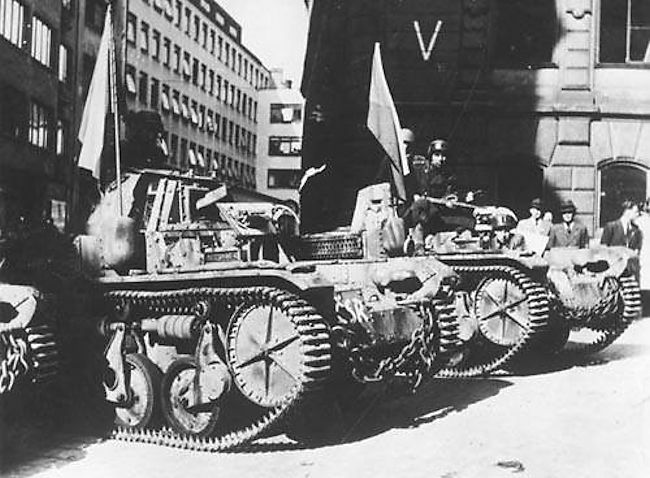 The regular vehicles would be fitted with an AVIS-2 turret and a 13.2 mm (0.52 in) machine-gun. But these plans were dropped, although the turret models were accepted. 100 were ordered including 8 command vehicles, factory designated ZT (this was purely chronological, without meaning). Changes compared to the AMR 33 were considerable. Despite relatively similar internal accommodations and equipment, the similarities ended here, as the engine and transmission were relocated and the suspension was brand new. The AMR 35 was larger and almost 1.5 tons heavier (6.5 vs 5 metric tons). It was assembled with armor plates riveted on a frame, ranging from 13 mm (0.51 in) for all vertical plates, 9 mm (0.35 in) for the glacis and sloped plates, and 5 mm (0.2 in) for the top and bottom. This meant it was better protected than its predecessor. The driver sat to the left and at his right was placed a large ventilation grill. The commander turret was placed offset to the left. Eventually, two turret types were used on the ZT-1, recognizable by their shape and armament. The 7.5 mm (0.295 in) armed AVIS-1 was octagonal and could receive an extra machine gun on a small AA mount on top of the turret. Normal provision was 2250 rounds. 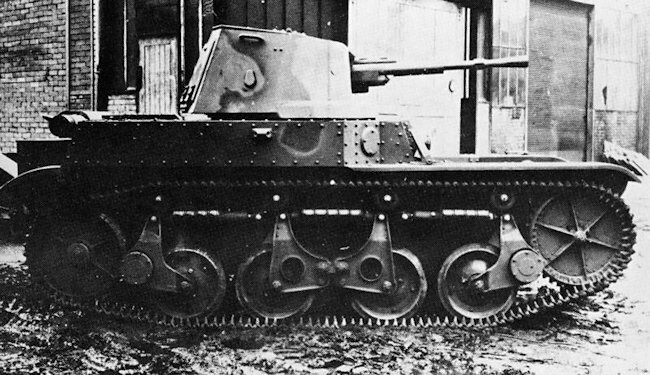 The AVIS-2 was fitted with a Hotchkiss 13.2 mm (0.52 in) heavy machine-gun. Radio command versions received a ER 29 model, operated by the commander. The suspension was of a new type, also used for the light tank R35, and was quite heavier and much sturdier than the previous design. It could, in theory, take twice the load it was intended to. It comprised a sprocket and idler of similar types, retained from the AMR 33, but with the no spokes in order to provide more strength, the sprocket just receiving dents. There were also four paired all-metal roadwheels resting on independent bogies front and rear, and a central twin bogie. All three were horizontally sprung with large rubber cylinder blocks. The central ones counted five smaller rubber cylinders separated by steel discs, acting as shock dampers. The track was 22 cm (8.66 in) wide and was supported by three return rollers. As shown at Vincennes, the AMR 35 could ford 60 cm (2 ft) deep rivers, cross 1.7 m (5.6 ft) wide trenches and climb a 50 cm (1.6 ft) obstacle or 50% slope. The Renault 447 22 CV four-cylinder 5881 cc petrol engine was capable of giving the 6.5 ton tank a top speed of 55 km/h (34 mph) and average top speed of 40 km/h (25 mph), making it the fastest French tank of the day. The engine had a maximum output of 85 hp at 2200 rpm. Fuel capacity was 130 liters. The transmission used a Cleveland differential, with single dry plate type brake with four gears forward and one reverse. The Zénith carburetor and Scintilla Vertex magneto allowed it to start at temperatures well below zero. 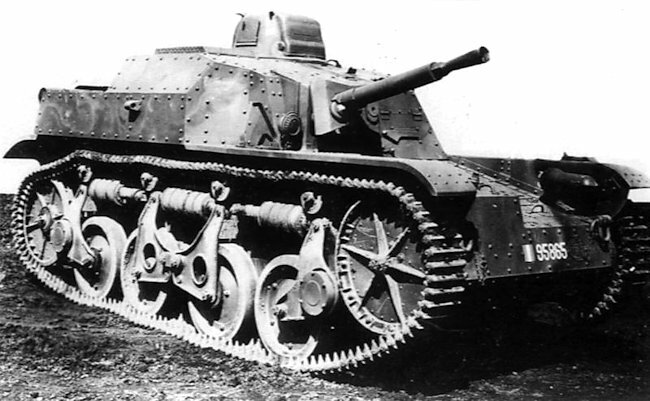 Renault AMR 35 ZT-2 Tank armed with a 25 mm autocannon. The first order asked for the delivery of ten pre-series vehicles in March 1935, but it was postponed to August. 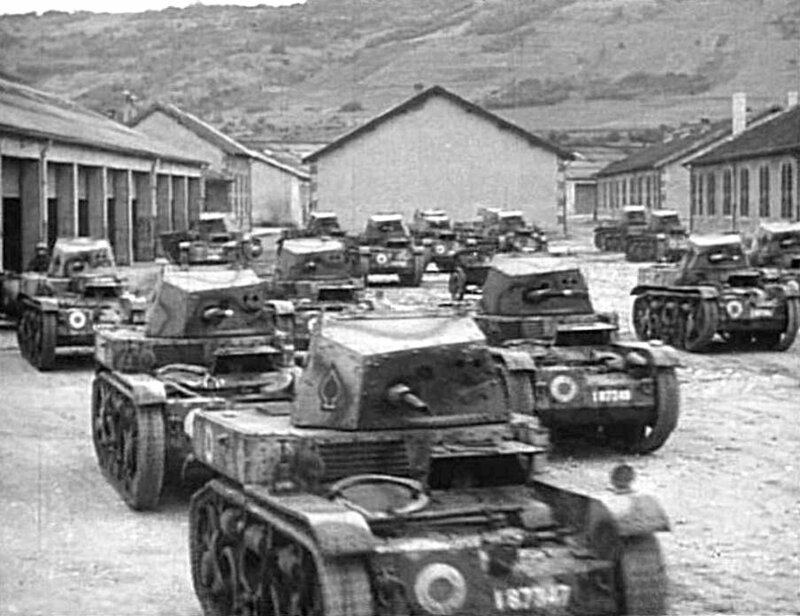 Due to a bad financial situation and strikes, Renault eventually refused the second order for fifty tankettes, but accepted an order, in April 1936, for only thirty others. There were coordination issues with the subcontractors as well, Schneider for the armor plates and empty hulls and Batignolles-Châtillon for the AVIS-2 turrets. By August 1935, trials at Satory had already led the army to ask for a change to the gear ratio and even refused the twelve vehicles delivered in September. These were returned for modifications and were accepted in October 1935. The first entered service on the 22nd of April, 1936. By June, seventy-six AMR 35s had been produced. However, exercises showed serious reliability issues due to weak mechanical parts, including the Cleveland differentials, which were not suited for such speeds. In 1937, production almost stopped to allow the refitting of 92 vehicles, but the problems with the differential persisted, some being replaced up to five times in a short period. By August 1937, a second and third series were started, and seventy-five were delivered until the end of 1938. Most were now equipped with a synchromesh gear box and reinforced chassis girders, but reliability issues persisted until May 1940 and availability was poor. In January 1939, only 123 were reported serviceable, while the others were in repairs. 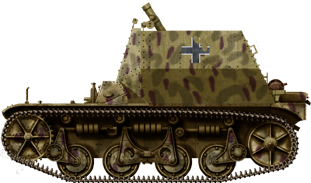 In 1936, it was envisioned to replace obsolete Renault FTs in service throughout the colonies with Renault AMR 35 ZT-4s, equipped with FT turrets. But this was given low-priority and, out of a total order of 56 vehicles, only 40 had been completed when France surrendered. Another variant was the AMR 35 ADF (Renault YS), used for artillery observation, and equipped with advanced telemetric systems. Renault AMR 35 ZT-3 self-propelled gun armed with a 25 mm (0.98 in) SA34 L72 cannon. 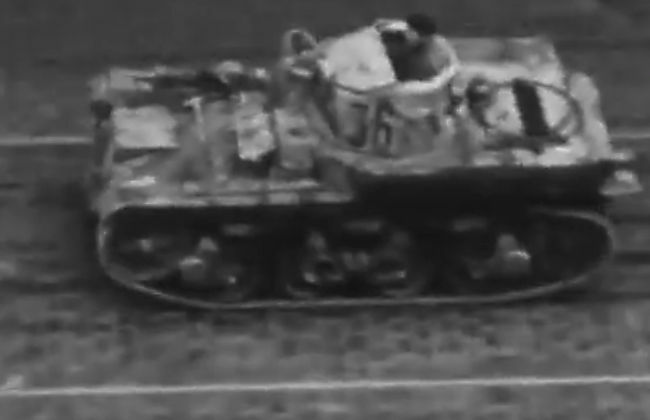 In May 1940, 178 AMR 35s equipped the French Army. Tactically, they operated in three squadrons for each DLM (“Division Legere Mecanisee”), and two squadrons for each DLC (light cavalry divisions). Deployment comprised four AMR 35s for the 6th and 7th GRDI, sixty-three for the 1st and 3rd RDP, and twenty-two for the 2nd, 3rd, 5th, 14th, 15th RDPs (“Regiments de Dragons Portés” or litteraly “Carried Dragoon regiments”). Tactically, and contrary to their acronym, they were used as fighting vanguard units, covering the infantry, rather than for reconnaissance, a role already taken by the Panhard 178 and SOMUA-Gendron armored cars. They were quite fast, so much so that the Germans had nothing comparable in 1940. Their actions are not known with precision, but their fate is shared between vehicles destroyed in action (due to poor armor and armament), abandoned due to the lack of gasoline or because of mechanical failure, mostly coming from the differential, transmission or, more commonly, because of suspension failure. 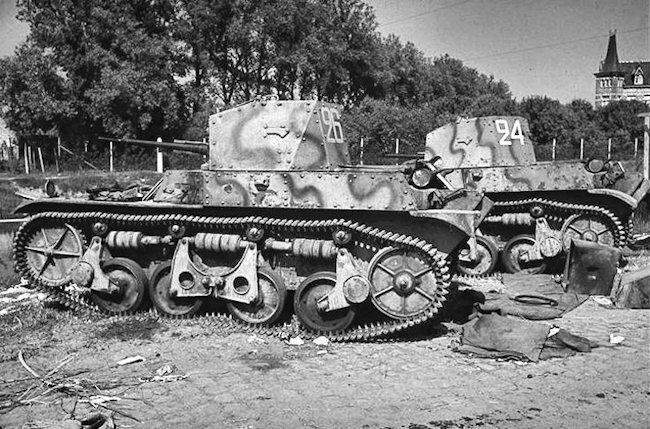 In German Army service, the few that were captured were called Panzerspähwagen VM 701(f). They were used for training and police duties in occupied countries. 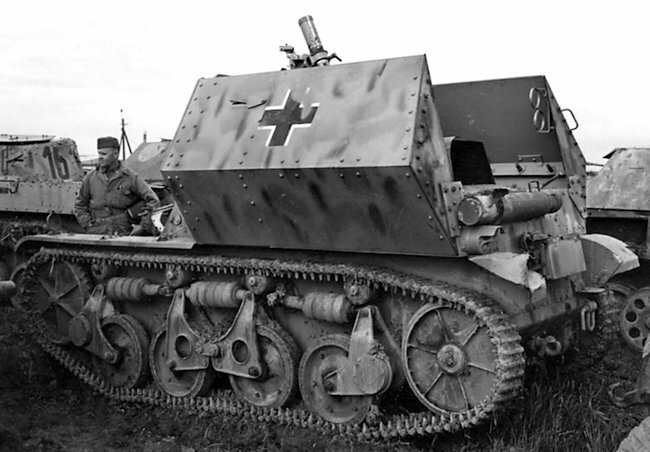 A variant called the 8cm schwere Granatwefer 34 auf Panzerspahwagen AMR(35f) self-propelled heavy mortar (abbreviated to 8cm Granatwerfer auf PSW AMR 35(f)) was fitted with a 81 mm (3.19 in) heavy mortar in an open topped armoured fighting compartment. The turret of the tank had been replaced with a lightly armoured superstructure of riveted construction that enclosed the fighting compartment. The top and rear were left open. The armour plate used on the front of the superstructure was 13 mm thick set at a 15 degree angle. The sides were also 13 mm thick set at a 40 degree angle. 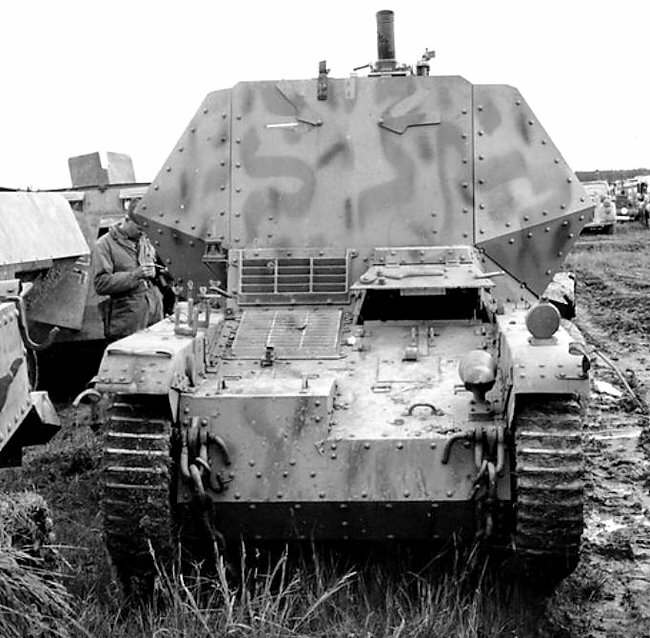 The fighting compartment included the space formerly occupied by the turret and the space above the engine compartment at the rear of the chassis. The mortar was mounted at the front to fire forward. The front of the compartment was not separated from the driver’s position. He had to enter it from the rear. The 80 mm mortar tube rests on a base plate bolted to the top of the engine compartment. The bipod retains the normal cross-levelling, elevating and traversing mechanism, but the legs have been extended and are attached to a rack and pinion mechanism which permits additional elevation, traverse and levelling adjustment. The mortar was equipped with a collimator mortar sight RA35. 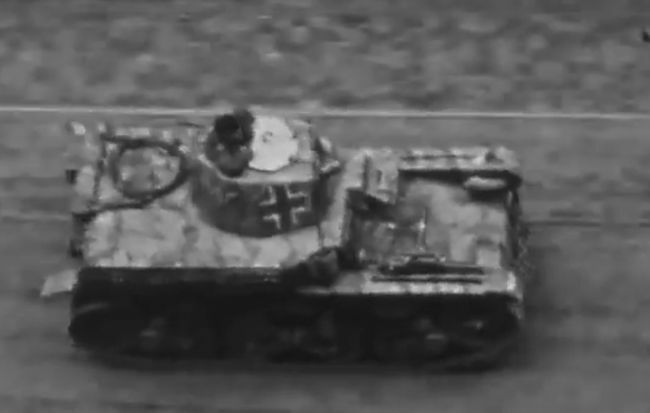 A black and white video taken from an upper window of a tall building in Prague, Czechoslovak called ‘Květnová revoluce v Praze 1945’ held in the Czech Republic Národní filmový archiv records nine German operated French built AMR 35 Panzerspähwagen VM 701(f) tanks patrolling the streets of Prague during the 5th – 9th May 1945 uprising against the German occupation of the city. Regular AMR 35, equipped with the AVIS-1 turret (Batignolles-Châtillon) and the 7.5 mm (0.295 in) Reibel Châtellerault MAC31 machine gun. 87 built in all. AMR 35 ZT-1 equipped with a heavy 13 mm (0.51 in) Hotchkiss machine gun with 1250 rounds. Fitted with the AVIS-2 turret, 80 built. AMR 35 ZT-2 tank hunter. APX 5 turret (built at Atelier de Rueil) and 25 mm (0.98 in) SA35 L47.2 or L52 autocannon (78 armour piercing and HE rounds) with a secondary 7.5 mm (0.295 in) Reibel coaxial machine-gun. Only ten built, after production dragged on until 1940. They completed the intended RDPs batallion organic strength. AMR 35 ZT-3 SPG tank hunter, with a 25 mm (0.98 in) SA34 L72. Ten were built at APX (Ateliers de Puteaux) until September 2, 1939. A rare German battlefield conversion, 8cm Schwere Granatwerfer 34 auf Panzerspähwagen AMR(f) self-propelled heavy mortar. 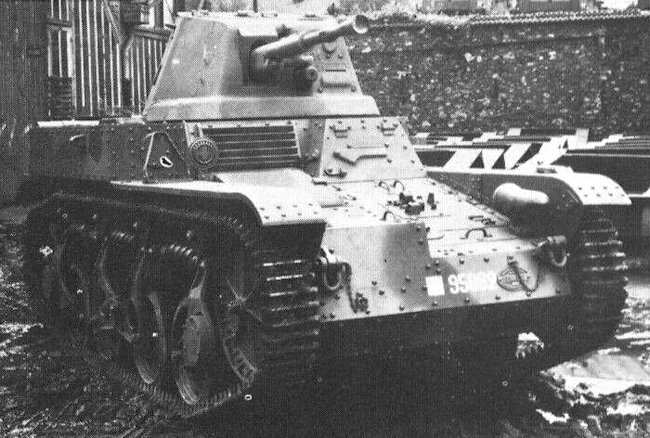 Renault AMR 35 ZT-1 tanks armed with a 13mm Hotchkiss machine gun. Renault AMR 35 ZT-2 tanks armed with a armed with a 25 mm autocannon. 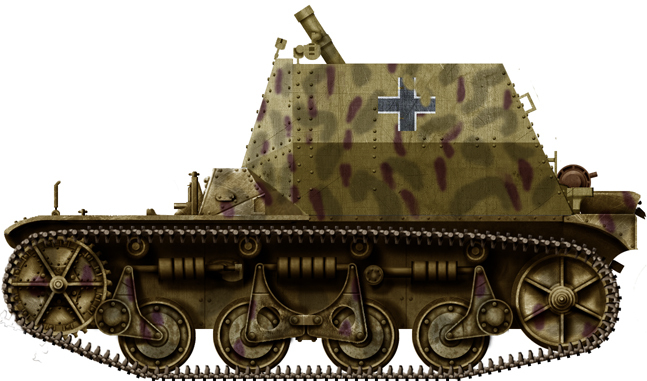 German 8cm schwere Granatwefer 34 auf Panzerspahwagen AMR(35f) self-propelled heavy mortar. Front view of the 8cm Granatwerfer auf PSW AMR 35(f). It is being inspected by a soldier for the US. 3rd Army as it was found in their area. A report on the vehicle was sent back to America. 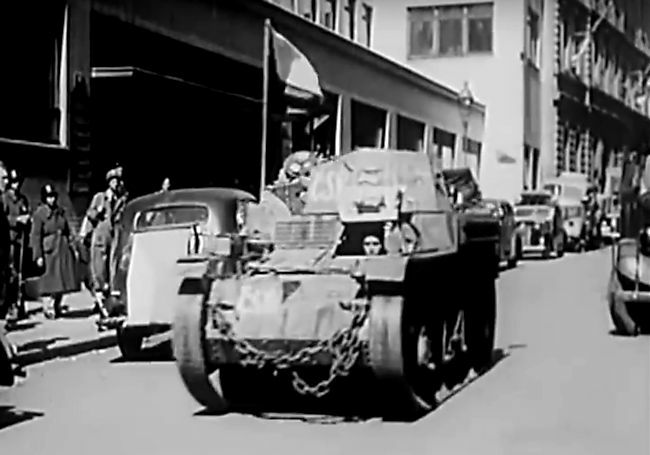 On 5 May 1945 three German operated AMR 35 (Panzerspähwagen VM 701(f)) tanks were captured around Bartolomějská Street in Prague. 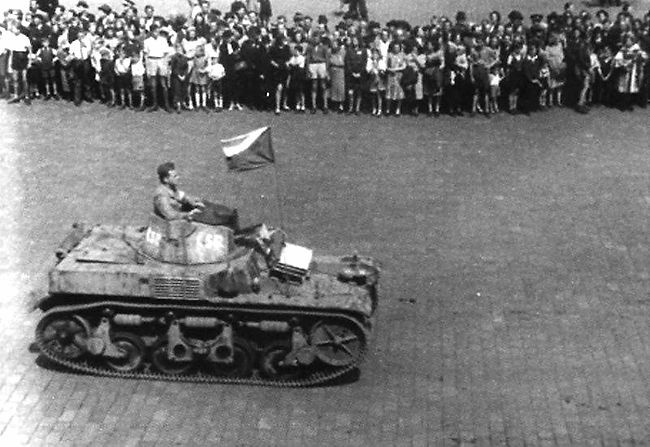 They were taken in to service with the new Czechoslovak Republic Army after the war. The writing on the turret is Czechoslovak Republic.